Dinner has never been tastier (or easier!). 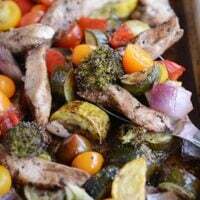 This healthy sheet pan balsamic chicken meal can be yours in less than 30 minutes; it is delicious served on its own or over pasta! 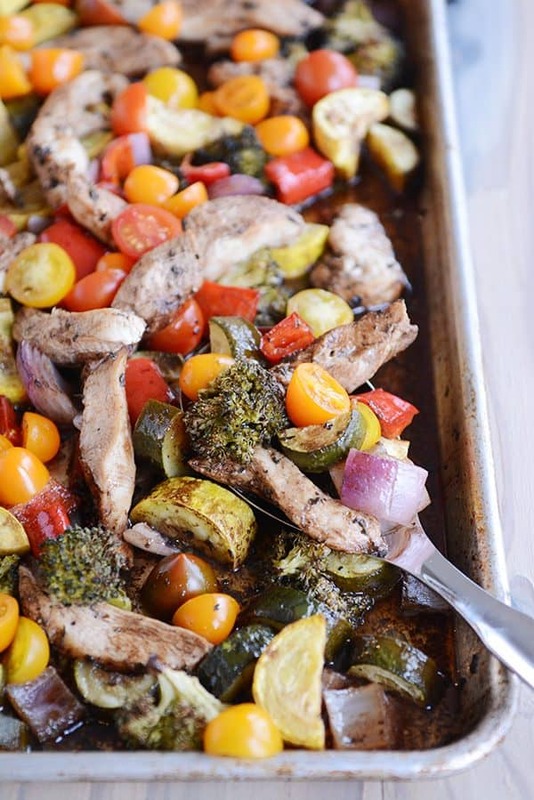 Well, if this delectable sheet pan balsamic chicken and veggie meal has taught me anything, it’s that sometimes the tastiest (most colorful!) meals don’t have to be difficult. This sheet pan dinner is about as easy as you can get! And the flavor and yummy-factor are out of this world delicious. It kind of takes the “eat your colors” mantra that I preach to my kids about every day to a whole new level (and no, orange Hot Cheetos don’t fulfill this criteria). Amazingly, given my teenagers’ love for the aforementioned Hot Cheetos and Takis (please tell me he’s not the only one), no one complains when this simple dinner shows up on the table. 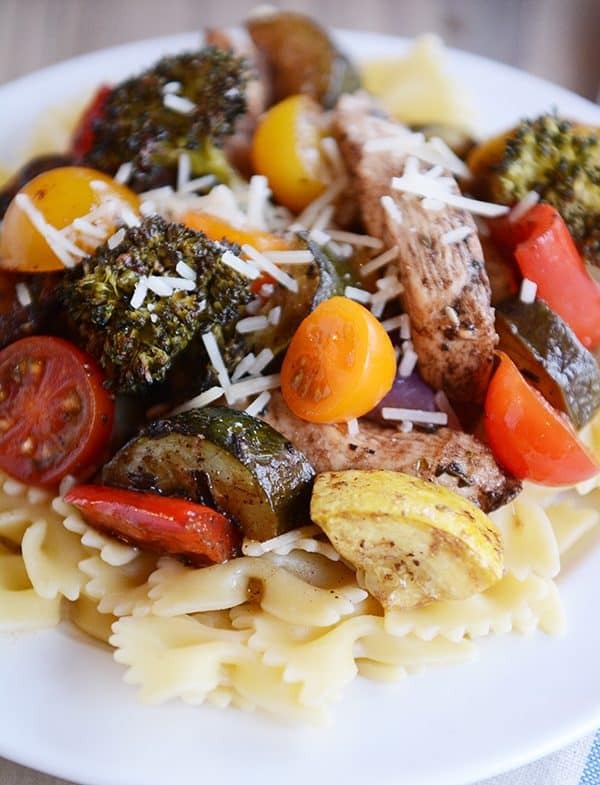 Of course, it doesn’t hurt that a lot of times, we take the delicious mashup of chicken + veggies + seasoned balsamic sauce and toss it all on top of pasta. With a hefty sprinkle of Parmesan cheese. 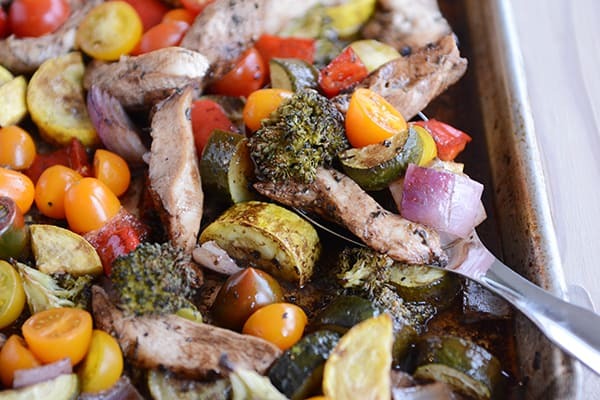 This sheet pan balsamic chicken meal is perfect with pasta. The lingering tangy and sweet sauce on the bottom of the sheet pan gives just the right amount of oomph to the tender pasta, and I’m guessing it’d be wonderful over quinoa or rice, too. However, the sheet pan ingredients are fulfilling and delicious served on their own, too, for a low-carb, healthy meal. 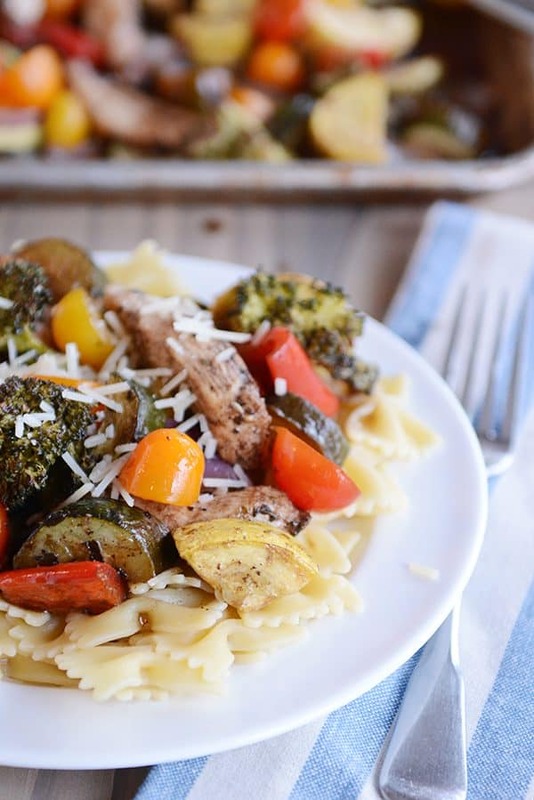 We’ve already established that roasted vegetables are where it’s at, but you throw them in with chicken and Italian-flavored balsamic goodness, and they are out of this world. You creative home cooks don’t need me to mention this, but those vegetables you spy up there? Yeah, they are super adaptable. You could change out any of the vegetables listed in the recipe for other veggies you have on hand or ones that your taste buds like just a teensy bit more. Cauliflower. Asparagus. Brussels sprouts. Mushrooms. You can also cook the tomatoes right in there with everything else, but I like the fresh pop of flavor they add when I toss them in after the whole mashup of sheet pan goodness comes out of the oven. Check out the notes of the recipe for a few other suggestions, too! Sheet pan dinners may be, like, so last summer, but I’m hanging on for dear life. This one’s a keeper. 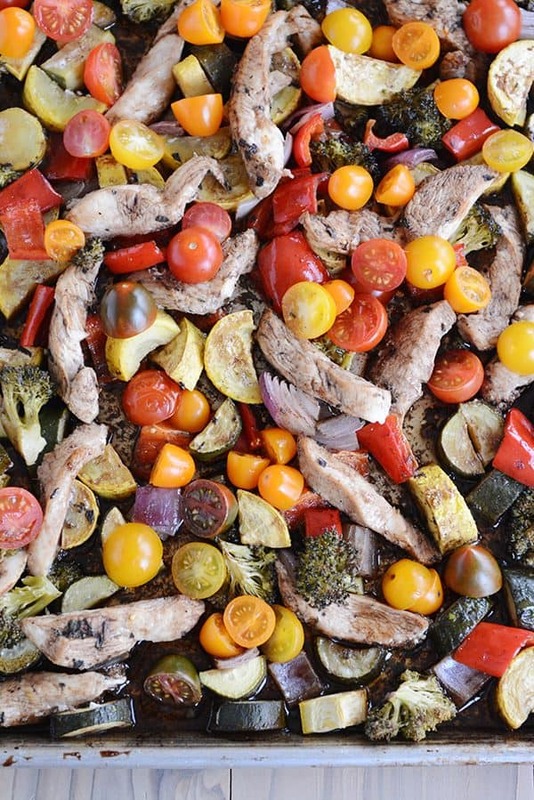 Place the chopped veggies evenly on a large sheet pan (about 11X18-inches or so). Lay the chicken strips on top of the vegetables. In a small bowl or liquid measuring cup, whisk together the balsamic vinegar, oil, honey, basil, oregano, salt and pepper (if the honey is too thick to whisk in evenly, microwave or heat the mixture for a few seconds and then whisk together). Pour the mixture over the chicken and veggies. Toss everything together until the chicken and vegetables are coated with the sauce. Arrange the ingredients in an even layer again making sure the chicken pieces aren't overlapping each other. Bake for 12-15 minutes until the vegetables are sizzling and crisp-tender and the chicken is cooked through. Add the cherry tomatoes into the mix and give a quick toss. Serve immediately (as is, or over pasta with a sprinkle of Parmesan cheese). If you like more of a cooked, juicy, burst tomato texture/taste, you can add the tomatoes during the cooking time. I like the fresh pop of adding them at the end just before serving. It kind of goes without saying that the vegetables are really adaptable here. You could sub out the vegetables in the recipe for other choices like asparagus, cauliflower, brussels sprouts, etc. ﻿If you want to roast the vegetables longer (for more tender veggies), you can either keep the chicken breasts whole instead of cutting into strips and increase the cooking time to 20 minutes for everything (or longer, depending on how thick the chicken is) OR you can start the veggies cooking first and add the chicken strips after 5-7 minutes of cooking. This is incredible! I cook this so much now. I have mixed it up with just Italian salad dressing too! This sat in my pile of recipes to try for WAY to long. Delicious!! I love the variety of veggies you can use as a base. I was skeptical about everything being cooked through, so I went about 20-25 minutes and it was perfect. The veggies had just the right crunch. Thanks! Oh yes, and when my son saw me getting all the veggies ready, he started to turn up his nose. Then he asked, “is it from Mel? !” When I said yes, he was willing to eat it without any problem. Oh my goodness, thank you so much, Gwen! So happy you are loving the recipes! Made this with beef- used half balsamic and half red wine vinegar, sweetened with Bumbleberry whipped honey from Honeyville (Durango, CO). Yum- total win with everyone! Tenderized my meat w/ salt while it sat and then browned it w/ fresh crushed garlic before mixing it in w/ the veggies and roasting. Seasoned w/ thyme and fresh rosemary before serving. Delicious w/ toasted breast (buttered, garlic and onion powdered and a sprinkle of Parmesan cheese). Delicious all round! My kids- 12 down to 11 months ate quite well- all we had left was one serving for Daddy’s lunch the next day. Doubled veggies and sauce. I put the veggies in for 15 minutes, reserved a little of the sauce and marinated the sliced chicken while the veggies cooked. Then I added the chicken and tomatoes and cooked for another 15 minutes. The kids went crazy for it! Well this was divine. Some reader mentioned overeating vegetables… Me too, girl! I cooked it for 20 minutes and it was fantastic, but I think I could have pulled it out at 15, too. I would just recommend cutting thinner strips than you think. Mine were super thin and it was perfect. Mel, this was seriously the best. I want to make it once a week until my kids receive it with zero complaints! 😀 I would TOTALLY be in favor of more sheet pan recipes like this. If there were different flavors/sauces to throw on the chicken and vegetables, I would welcome it with open arms, in case you ever feel like experimenting. Thanks for another winner, Mel! You’re in luck, Annie! I have another version coming in a couple weeks! Yaay! I’ll be on the edge of my seat! Also, I came back to post a critical update: I tried this on a bed of spinach tonight and it was AMAZING. Not just marginally-acceptable-spinach, but legit delicious. It made for a wilty salad and was just so dang good! More vegetables, more colors, more tasty. I made this today and it was delicious! I did need to cook it for closer to 35 minutes than 15 for the chicken to get done and the veggies to be al dente as opposed to raw. Are your cooking times for induction ovens? No, the cooking times are for my standard oven. I do like my veggies fairly crisp, though, so maybe that’s it? How odd. The veggies still fairly crisp when it was done, and the chicken was definitely raw for the first 35 minutes or so until I put it in for the final five. The veggies weren’t even all warm after fifteen minutes. Baking times are always correct for things like cakes and cookies, so I think my oven is accurate. Maybe I’ll have to test it, though. Hmmm…from the pictures, is my pan more or less crowded with veggies and food than yours? Wow, wow, wow!!! This was SO delicious, I made it just as it says in the recipe. I served it over pasta with Parmesan sprinkled on top. my kids were taking 2nds and 3rds! So good for you, so easy, so yummy. Will definitely be making this again. We put some of our traditional balsamic vinegar that we got from Italy in March (aged over 25 years!) on the side to dip their bites in. HIghly recommend! I have never loved vegetables more! I can now say that I have over eaten vegetables too hehe. Thanks for the great recipe. So yummy and so easy. I always have a tough time cooking chicken just right, but this recipe made my chicken a super hero – saving the day from dry, tough, chicken. The flavors were so perfect together. We loved it, but the next time I make it, I’m going to cook the veggies longer and add the chicken later, for even more roasted vegetable goodness. All I have to say is…. WOW! This is delish and so easy. What more could you ask for? Way to go Mel! OMG yum!! This was so good! I used regular white onions cause I had them, but used all the other suggested ingredients. I used chicken tenders with great sucess! They were juicy and flavorful! I would recommend this to anyone! I didn’t like it, either! However I am going to try it again and sub some veggies I like better. I’m also going to try and make the sauce thicker. Any suggestions for that, Mel? You could try simmering the sauce before using so it can reduce. Wanting to make this for a vegetarian in the family. Wondering if it would be good to sub out the chicken for tofu? Could certainly experiment – never tried it myself. Good luck! Made with asparagus, Pepper, broccoli, cauliflower, zucchini, (no summer squash as this isn’t available in Ontario right now) onion, chicken. Very good!! Next time I would do it with a side of brown rice, that would go so well with this I think. It took me a lot longer than 15 mins to cook this though but maybe I added too much chicken as I did not weigh it. Thanks Mel for another great recipe. Very tasty! Thank you for sharing this delightful dinner recipe. Made this for dinner last night, and it was pretty fast and tasty. I would suggest to double the sauce that you pour over. Thanks Mel! Amazing! We put it with couscous and topped with parm. Delicious. Thanks, Mel! So delicious and easy! I reserved some of the pasta water and added a bit of the water, some butter, olive oil, and Parmesan cheese to the pasta so that it had a light cheese sauce on it before tossing the veggies and chicken over it. It was so good! Thanks for another quick go to recipe! I made this last night and served it over farro, it was delicious! So easy to make and the whole family loved it. I will definitely be making this frequently, especially on nights when time is limited!! We loved this with fresh basil added right before serving. So delicious! Thank you. Double thumbs up to the fresh basil. Yum! I made this for dinner and was delighted at how easy it was, especially since I bought pre-trimmed chicken breast chunks. The flavor was stunning! I’ve done roasted vegetables before, and I like them, but these were superlative! I served it over pasta for my carb-loving kids. My 5-year-old had a tantrum that we ran out of broccoli before she had all she wanted. When does that ever happen?!? Big winner, and it’s going into my two-week rotation. Thank you! This was so good and so easy! Thanks for another awesome recipe! This was AMAZING! I couldn’t believe how well my kids ate it up, and my husband commented that the flavor combination was incredible! Thanks for yet another quick, healthy, delicious meal! This was SO good!! I’m five months pregnant and anything that is healthy, fast, and tastes yummy is a serious winner!! Thanks for another great recipe! Amen to that – good luck with the rest of your pregnancy! It was delicious! Definitely a keeper. I needed to cook for an extra 10 minutes for the chicken to be roasted. Guess my skinny strips needed to be skinnier. Thanks Mel! This was SO GOOD!! I used cauliflower, butternut squash, red onion, zucchini, and green peppers. This is definitely a keeper! Glad they were a hit, Jodee! Made this last night and it was AMAZING! All of my 5 kids liked it too:) This will be a staple at our house! Thanks for letting me know, Sammi! Whilst making one of our favorite (easy) dinners last night, I realized you had just posted this… I prepare mine a little different but the finished dish? Same. The flavors? Swoon! BTW- while I detest Takis and flaming hot Cheetos, I’ve learned I can get a lot of milage out of them. Ok, maybe it’s bribery but the work my oldest will do for a single bag is amazing! This recipe sounds delicious and is on my “to make” list. Note to self: be sure to cut onion into small pieces so that it is thoroughly cooked. I don’t like un-done chunks. Also, I don’t know if it’s just my printer, but the little photo isn’t on the printed version. Having that little picture is a great recipe reminder for my recipe file. Thanks for your wonderful recipes, Mel. I can always depend on you to come up with the best! Thanks, Beth! 🙂 I don’t have a way to print the photos with the recipes yet, but I’m working on a print version that will let the reader decide whether to print the photo or not. Hopefully it’s up and running soon! I made this tonight with cauliflower, broccoli, onion, thin sliced carrots and Campari tomatoes. It’s what I had on hand. Since I had none of the veggies in the recipe I wasn’t sure how it would turn out but it was wonderful. This is the perfect recipe to use up those veggies in the fridge. Anything would work. I tend to have to ‘eyeball it’ (no pun intended) and I can’t even begin to count the pounds of sugar and butter and other ingredients I’ve wasted over the years. Long story short….help? What the bleepity bleep am I doing wrong? Oh darn, sorry candy is such a frustrating kitchen experiment for you. A few quick questions – what kind of pot/pan are you using? Also what type of stove do you have (electric/gas/induction)? Hi Mel! Thanks for all of your great recipes. You are my spirit animal. I think we would be besties IRL. Question. I can’t do farm raised chickens. The conditions those poor flightless bird animals are subjected to exceed what I can tolerate. I can’t do free range chickens either because they eat too many bugs, and I am allergic to most insects (except for ladybugs, strangely). I do eat grass fed beef, however (I think that corn fed beef is a sin against nature). Do you think I could substitute the chicken for steak? If not, I do eat a lot of quail – do you think that would affect the taste? Love your choice of veggies, Sheri! Fabulous! Made it last night and my family Loved it, which isn’t an easy task! I used brussel sprouts, green beans, mushrooms, zucchini, and tomatoes. We served it over farfalle noodles and put fresh Parmesan on top. On a side note, thanks for your AMAZING site, Mel! I have been a user for about 5 years and it is literally my go-to. Dinner party? Check Mel’s. Sweet bread? Check Mel’s. Salad? Check Mel’s. (Don’t even get me started on how browned butter changed has my life! ) You get the point so I just wanted to say, THANK YOU and keep posting Fabulous recipes!! I made this recipe last night. I basically followed the recipe except I used cauliflower instead of broccoli. Also I used whole chicken breasts, (boneless, skin on), which I gave a head start and then I added the veggies and sauce to the pan to finish. It came out to be a delicious meal. Thanks for checking in with your review, Louise! Glad you enjoyed it! Made this for dinner last night, but used chicken quarters instead and cooked them longer. It was fantastic! Definitely will make again! I can’t comment on the recipe because I’m still reeling that you have a teenager! How did that happen? I know. Tell me about it! I was just telling him the other day that he was 3 (THREE!!!!!) when I started this blog. And then I started weeping. How can that really be? For those of you who have made this, does the sauce have a super strong vinegar tang to it? I’m not a huge fan of that flavor but I am thinking with the honey, it will be pretty tame, perhaps like a barbecue sauce? Hey Kelly – I’ll chime in to say that the balsamic flavor IS pretty strong in this recipe. This was delicious! I read the recipe and picked up everything I needed an hour later at the grocery store. A great blend of flavors! I added artichoke hearts and cauliflower instead of broccoli. The kids and husband ate it over pasta, and I had it straight, with some parmesan. I even made a double batch so I can have healthy, delicious lunch options this week. I just wish the balsamic flavor came through a little bit stronger… I might try marinating everything for an hour or so next time. Thanks for another good one!!! Thanks for the report, Kamber! I’ve made this with 1/2 cup balsamic, too – that definitely ups the balsamic flavor (but also adds more liquid to the bottom of the pan, too). This was amazing and my kids absolutely loved it! I needed something quick and easy tonight and when this showed up in my inbox today it was the perfect solution. So happy to hear that, Christa. Thank you! Haha, so happy you finally had all the ingredients just waiting there! 🙂 Glad to hear you loved this…and I think that sounds divine serving it over mashed potatoes. Yum! Looks amazing. On my menu for this week 🙂 what happened to your two to three week break you were going to take over Christmas? Any chance you will still make that happen sometime??? Ill admit I as a little sad at the thought, but now I feel bad you didn’t take a break. You deserve one!!! Hey Danielle – you are so sweet to even ask about that. I did take a little break over the Christmas holidays. It was much needed. But a little shorter than I intended mostly because I always underestimate how hard it is to ‘stay away’ – the work/comments/questions/emails pile up and before I know it, I’m back in 100%. Thanks for asking though! I have some goals for this year to help balance blogging and life, and I’m excited to implement them and refocus my priorities a little! Don’t feel bad at all. I’m here because at the end of the day, I love it (and you guys!). I loved the flavor of your recently posted stew and I have the pan sheet dinner on the menu for this week. But the biggest change for me this year is I started making kefir. Smoothies are the best way ever to help my kids, husband and mom consume healthy stuff they wouldn’t otherwise eat. You can hide a lot of spinach in those smoothies 🙂 I am feeling all around better and my daughter usually gets stomachaches and has had a lot less lately. Wahoo!!! That’s awesome, Danielle! I seriously feel like kefir has changed our lives for the better, too. Yay! Excited to try this one! Thanks Mel! Perfect timing! I have many of these wonderful veggies in the fridge and need some inspiration for serving them. Thanks for coming to the rescue Mel! I have the week’s dinner menu mostly planned out, but I couldn’t think of anything for tonight. I figured I’d check your site and, lo and behold, a delicious-looking new dinner recipe to try! You never disappoint! 🙂 I am looking forward to making this tonight. Thanks, Mel! Hope you enjoy it, Launi! Excited to try this one! I’m worried there might not be enough sauce to spoon over the pasta. Is there? Hi Katie – the vegetables help add more sauce-factor as they’ll put off liquid while they cook, however, having said that, it’s definitely not an overly saucy dish. You could amp that up by adding 1/4 cup or so of chicken broth to the balsamic/honey mixture. Ohhhh, this looks good! I love sheet pan dinners! So excited to try this one! Thanks, Mel! Happy Monday!